GOP Rep. Brian Babin on Thursday urged House Democrats to nix a trip one of their own members has planned to visit Palestinian-controlled territory. 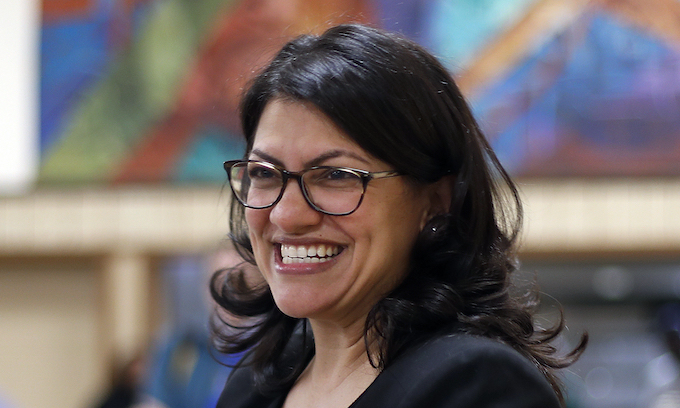 Mr. Babin, Texas Republican, said Rep. Rashida Tlaib’s planned trip would damage America’s foreign policy interests. 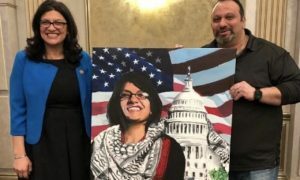 Rashida Tlaib with pro-terror Hezbollah’s Abbas Hamideh at congresswoman’s swearing-in ceremony. The Michigan Democrat, who is the daughter of Palestinian immigrants, said last month she’d like to lead a group of lawmakers to the West Bank, instead of joining another trip already planned to visit Israel. That trip is sponsored by pro-Israel lobbying group American Israel Public Affairs Committee, which routinely schedules visits for newly elected members of Congress. “To signal to our most threatened ally in the region that the United States Congress sanctions an official trip to visit Israel’s nemesis would be an exceedingly dangerous path forward,” Mr. Babin said in his letter to the chairmen. According to The Intercept, Ms. Tlaib is in the early stages of organizing the trip. She told the outlet the AIPAC trip doesn’t provide “a real, fair lens” about segregation. She would need permission from a chairman to make the voyage. If Representative Rashida Tlaib is a true American, then she should act like one. Obviously, she does not understand that all men are created equal. Maybe that is because she never read the Declaration of Independence. I wonder if she even stands up when the the Pledge of Allegiance is recited. Treason by definition is aiding and abetting the enemy. Hamas has been designated as a terrorist group. If she goes, put the cuffs on her with a perp walk awaiting her return. Just how many vote eligible Muslims are in her district anyway? We all know why the Democrat overwhelmed and diverted FBI is not investigating? She needs to be gerrymandered out of existence to lower the planted 5th columnist ranks within the Democrat Congress. She should have already had the cuffs put on her, by having a KNOWN hamas sympathiser be there for her swearing in.. This woman is a traitor to the Constitution and needs to be removed from Congress, permanently. I am in favor of her going as long as she understands that because that trip is a betrayal to America, that her passport will be yanked and she cannot come back, ever again. This is another example of how deranged and consumed with hatred the Liberal Democrats are. Why would ANYONE vote for such a disturbed Muslim pig (Rashida Tlaib) to represent them in Congress and represent the country? The Liberal Democrats In Michigan are a sick group of people. Being a solid chunk of those voting for her, WERE FELLOW mudslimes, of course they are deranged and consumed with hate for the USA..
Let her go alone and make it a one-way trip. Congress better get a handle on the muslims in Congress like Tlaib. They are in our gov’t but they are not our friends. WAKE UP! You do have to ask yourself, how ANY state in the U.S. could/would elect some Muslim to ‘invade’ America’s government? That is exactly the plan of that “peaceful religion” Islam to eventually ‘control’ countries. Think it can’t happen here? Obama already let some of that Muslim Brotherhood gain access! Now, TWO new Muslims in our vaunted, luckily DO NOTHING, congress. But I digress, it is an harbinger of the times that are coming. On this particular issue; what NEW, freshman, congressperson has the NEED to go anywhere, except SITIN and learn? What, exactly, is the ‘benefit’ to America to have these nitwits running around the world on the taxpayer dime?? SHUT’EM ALL DOWN! Private planes self funded or paid by for by the Democrat party. Why do these representatives of the people think they should get to globe trot on our dime especially since they very seldom accomplish anything. Pelosi met with Assad in Syria during the G W Bush administration after being told not to go. Logan Act disobedience? Flynn has been persecuted for not remembering his conversation with the Russian ambassador as part of his duties in the transition.Bill Clinton and Carter sought to undermine Bush by traveling around the world. Democrats are allowed to wage foreign affairs even in opposition to the USA administration. And our spineless GOP Does nothing. Makes you wonder, why we keep electing them. The “MF” Muslima who lied about her home address since she never would have been elected by the Muslim men in Dearborn where she actually resides, supports the Muslim terrorists who have sworn the annihilation of Israel. They call the USA, “The Big Devil” and Israel, “The Little Devil.” MF Muslima wants to start spending taxpayer money to support terrorists. Democrat voters sure can elect the worst represenatives filled with vitriol and hatred! This is a woman that is worried about other politicians not being totally for the US and having interests more for Israel than the US. Yet, she has a map of Palestine on her wall blanking out Israel, so where are her interests? And this crap about being from Palestine is getting old. There is no such country, it’s just a bunch of terrorists that are camping out on Israeli territory, hoping to run out the Jewish people. Maybe this radical muslim will finally open the eyes of the democrat voting Jews in this country! Obviously in pushing for an islamic calphate it seems. Let her go with only one stipulation. It’s a one way ticket. Let her stay with her true constituents. One way ticket; sure. Also, it would be neat if a couple of Israeli commandos were to pay her a visit. How many days in the house? and she’s already learned to use OUR money? And to travel back to PLO! Well, I guess she has to go to PLO Central to get her INSTRUCTIONS for how to undermine the US and insert Sharia-friendly legislation into the House voting docket. These VERMIN do NOT belong in Congress! For one thing, any oath of office they took on their filthy Quran is a filthy LIE. They do NOT support, much less DEFEND our Constitution! This creature has made NO SECRET of her desire to replace that Constitution with Sharia Law. HOW is it even LEGAL for her to be seated in Congress? Her election should be nullified, and DEPORT her sorry, America-hating MUSLIM FANNY back to one of the Islamic HELLHOLES from which the likes of her were spawned. The whack wants to go to Palestine, DEPORT her there. America’s taxpayers would finally receive some actual, positive, result from having spent their money! Better wake up America, before it’s too late! This toxic COCKROACH has done NOTHING but make trouble since the day she arrived in Congress. Gosh, who could have predicted that? ME, for one. The voters in her state had better focus on PRIMARYING her sorry Muslim fanny the very next time she is up for election and get RID of her, as they are already well on their way to becoming the FIRST Muslim “no-go” zone in America! If the House were not controlled by EQUALLY America-hating DEMOCRATS, she could be impeached for openly consorting with, and aiding and abetting terrorists. Since that is TREASON, I believe it qualifies as “high crimes and misdemeanors” for impeachment! But you just KNOW the conniving, America-hating COMMUCRATS are going to rubber-stamp EVERYTHING she wants to do, and will KILL any attempts to impeach her. I can’t believe the voters of Michigan are so DUMB that they let this happen. They should have moved heaven and earth to keep this COCKROACH–and the OTHER Israel- and America-hating MUSLIM who got elected–out of our Congress! If you don’t think they will be sponsoring and PUSHING anti-American and anti-Israel, Sharia-friendly legislation, you haven’t been paying attention to what VERMIN like these have done to Europe. ESPECIALLY look at England, where the COCKROACHES have SLITHERED into positions of power and enacted laws that make a CRIME to even speak out AGAINST them. You can be sent to PRISON for speaking out against the Muslim COCKROACH agenda in England. Is everybody just going to sit around and WATCH while these VERMIN do the same thing here? I think everyone here (maybe not Teeflo, and bigunit) realized that. If she does go, I demand a CIA covert operation be assigned to surveil her everywhere she goes & record every conversation she has. I also demand a FISA warrant be issued to do same as above while she is in Congress. She has been in America’s face with her sympathy & support for Islamist radicals & known terrorists / terror groups who have made very clear they will never stop trying to conquer or annihilate America along with Israel & every Jew everywhere. It is obvious that she is very dangerous & is openly acting on behalf of radical Islam to undermine & betray USA & Israel in any way she can. By her own statements & actions to date she has no allegiance or loyalty to USA & cannot be trusted to act in our nation’s or citizens interests. Wihch is why i feel she should be locked the hell up in gitmo..
Well duh. She already refers to herself as a muslim palestinian. Once you let the bacteria in, no matter how healthy the host was prior to infection, the bacteria works to destroy the host. Only diligence and aggressive antibacterial treatments can prevent the bacteria’s goal of killing the host. Congratulations, Democrats! You must be so proud. That’s some proud legacy and proud future too! This puke called President Trump a MF. I think we all have her number now. I hope Israel will refuse her entry. She hasn’t heard the last from me. Let her go, on her dime, and let the Israelis arrest her inside their territory as a PLO spy. She’ll never be able to sit in her House seat for the next 2 years. NO Legislature should be allowed to leave the country while the Government is shut down, even partially. STAY here and work FOR the American People who elected you. What in the Hell is the matter with you! Especially when that trip is to an ENEMY of our allies..
NO TAXPAYER FUNDED TRIPS UNTIL THE GOVERNMENT IS OPEN, period. Another Leftist displaying again how much they hate Americans and the United States. Seems to be the main theme for the new Leftist Democrats. It seems to be the norm for liberals period. NOT just the new brand of leftists.. I did not realize this woman was the Secretary of state acting under instructions from POTUS, otherwise this could be viewed as a violation of the Logan Act… … just sayin.